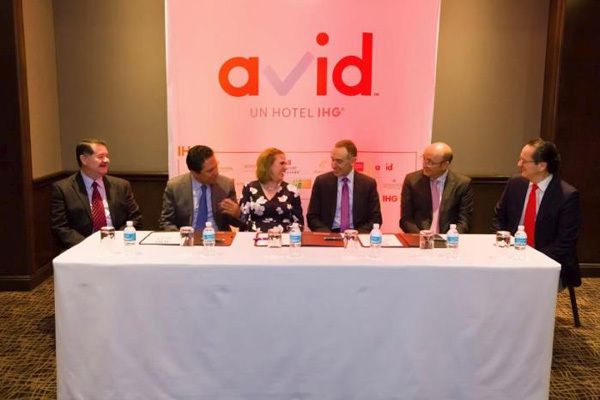 InterContinental Hotels Group (IHG) has unveiled plans to open a new midscale hotel in Mexico with the recent signing of the first avid hotels property, which will be located in Fresnillo, Zacatecas. Executives from both companies celebrated the signing in a private ceremony in Mexico City. The avid hotels brand was thoughtfully designed for travellers who want a hotel experience that meets their expectations for the type of hospitality they value most—the basics done exceptionally well at a great value. The modern exterior hotel design will include an open and airy retail-like entry, a canopy, and will use the stairwell as an eye-catching red architectural feature. On the inside, guests will find vibrant, open public and work areas and inviting communal spaces that allow guests to relax, work, connect or eat. Guest rooms will include sound reducing features for a superior night’s sleep; a dedicated workspace; open, easy-to-use storage. The guest bathroom experience will re-energize guests with a fresh and bright design. The hotel will offer a high-quality, complimentary grab-and-go breakfast and marketplace options made for guests on the go. The hotel will be equipped with IHG Connect wi-fi with the fastest speed in the industry and the ability for loyalty members to be automatically connected for all future visits, and will also leverage IHG’s state-of-the-art, cloud-based next generation reservation system.